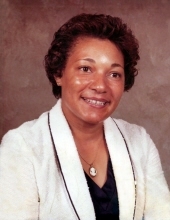 Mrs. Margie Elizabeth Wilson Royster, 74, of Chase City, VA entered eternal rest on Tuesday, November 27, 2018 at Wayland Nursing and Rehabilitation Center, Keysville, VA.
Mrs. Royster was born in Charlotte County, VA on November 2, 1944 to the late Bylinda Dailey and Alice McCargo Wilson. She attended the public schools of Charlotte County, VA and was a member of Rocky Branch Baptist Church, Red Oak, VA. Mrs. Royster was formerly employed by Jonbil, Inc. In addition to her parents, Mrs. Royster was preceded in death by her husband, Leroy Royster, eight brothers and four sisters. Cherishing her memories are one son, John Wilson of Chase City, VA; five daughters, Janice Wilson, Roxanna Wilson (Henry), Rhonda Newcomb (George, Jr.) and Deloris McFail (Sandy, Sr.) all of Chase City, VA and Christine Hayes (Mark) of Baskerville, VA; nine grandchildren, 18 great-grandchildren; four sisters, Betty Mosley of Chase City, VA, Ruth Dailey of Red Oak, VA, Barbara Staten of Richmond, VA and Alice Brogdon of Bethesda, MD, two sisters-in-law, two brothers-in-law, and a vast number of other loving relatives and caring friends. Funeral services for Mrs. Margie Elizabeth Wilson Royster will be conducted 2:00 P.M. Sunday, December 2, 2018 at the chapel of Giles-Harris Funeral Home, Chase City, VA with Rev. James Lindsey officiating. Interment will be private. Arrangements are by Giles-Harris Funeral Home and Cremation Service, Chase City, VA.
To plant a tree in memory of Margie Elizabeth Wilson Royster, please visit our Tribute Store. "Email Address" would like to share the life celebration of Margie Elizabeth Wilson Royster. Click on the "link" to go to share a favorite memory or leave a condolence message for the family.